Last night I had curry for dinner. Not just any curry, Malaysian curry filled with crawfish and a variety of veggies, poured over a bowl of jasmine rice. Sounds good right? (Unless you’re allergic to seafood but you can substitute chicken.) It was delicious. Should I have eaten it though? Nope. Why not? Because my New Years resolution was to lose weight meaning: no carbs! This includes potatoes, pasta and that perfectly cooked jasmine rice that I devoured. It’s the middle of the FIRST month of the new year and I have already broken my resolution. That got me thinking: Who came up with this sadistic tradition of setting us up for failure? Where Did The Tradition Of New Year’s Resolutions Begin? New Year’s resolutions date back to the ancient Babylonians around 4,000 years ago. They would hold lavish celebrations to honor the new year (which started for them in mid-March not January) when they planted their crops. Other cultures implemented these resolutions as a way to prepare for the year ahead. This brings us to the year 2018. The reason we make these resolutions today is usually to motivate us to improve on ourselves in some way. There are habits, traits or behaviors that we want to change for the better or have personal goals that we want to accomplish. What are the most popular new year’s resolutions? What Is Your New Year Resolution? Are You Still On Track? 1998: Get signed to a record label and become a star!!! 2008: Get on a UCB team and become a star!!! Feel better about your new year goals yet? Or maybe you want to modify your current goals? Below is a list of the most common new year resolutions that people make. Do any of these sound familiar to you? These are excellent goals to set but difficult to accomplish. Why do I say this? According to research, 40% of Americans make New Year’s resolutions. We start off with good intentions but only a tiny fraction of us keep them. In fact the University of Scranton research suggests that just 8% of people achieve their New Year’s goals. Why Do We Break Our Resolutions? We say goodbye to the old year and look forward with optimism to the new year. Why, then, do so many of us go astray? 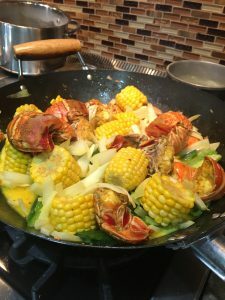 In my case, my family wanted to try a new recipe, the infamous Maylaysian Crawfish Curry. After the hard work that went into it, I had to at least try it to make sure it was good right? Wrong. I came up with empty excuses to break my resolution and then promised myself to do better next time. Isn’t that what we all do? That doesn’t mean that has to happen again. The most common reasons we end up falling short of our yearly ambitions are because we set unrealistic or unclear goals, we don’t keep track of our progress, we set too many goals or sometimes we forget all about the goal we set. 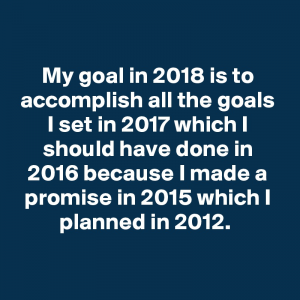 The facts remain, according to Statistic Brain Research Institute based on results gained January 9, 2018 only 9.2% of people who made new years resolutions felt they were successful in accomplishing them, 48.4% of people fluctuated between success and failure and 42.4% of people fail to reach their goals. Sounds dismal doesn’t it? So what can we do? Break The Failed Resolution Cycle! Next step, make your resolution explicit. Grab a notepad or open up notepad on your electronic device. Set your goals again (or choose another more reachable goal,) the mistakes you made last time and plan how you will succeed moving forward. Choosing good new years resolutions will determine how triumphant you will be. After choosing your realistic goal, resolve to commit to it. You can establish your own standards and schedule. This will motivate you to put forth more effort. As a caution, don’t make your resolution too big, it can become unattainable once you do that. If you have something major you want to change you need to either break it up into smaller pieces or allow yourself more time to accomplish it. Setting a sensible timetable also helps to define your goal without excessively worrying about a self-imposed deadline. For example, if your new years resolution is to exercise more because your schedule is hectic, don’t sign up for a year’s membership at the gym (at least not right away.) Grab a calendar and start planning out each day. When do you have more time, in the morning or evening? Maybe take a walk around the neighborhood during that time. Arrange with a friend to join you (but choose someone as motivated as you are.) Climb the steps at work instead of using the elevator or escalator. Take up a sport or physical hobby on the weekends. Then you can gradually increase your workouts. Look up your local gyms schedule to see if it fits with the times you have available. If the gym is close enough, walk there instead of driving. Add a few classes and then increase if possible. Exercise and fitness is one of many resolutions. You can take whatever resolution you have and focus on one aspect at a time to make them manageable. Then, give yourself sufficient time to complete each task. When we reach our goals, this boosts our self-esteem and we can challenge ourselves to do even better. I have also found incentives to be helpful in maintaining my goals. In my situation, instead of eating the curry through the week, we could have made it one day on the weekend as a reward for sticking to our meal plan all week. Quitting anything is difficult so when you do make progress, celebrate it. I’m not saying to go overboard. What I am saying is if you decided to give up chocolate for the year and went a week without giving into temptation, buy the mini size Snickers as a reward instead of the king-size. 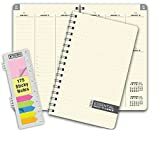 I found this free easy and detailed 2018 Annual Goal Setting Worksheet by Life Coach on the Go. It is an excellent resource that you can use and they offer other free resources you can try. We can make multiple attempts to achieve our goals. Hit that refresh button as many times as you need! How can you benefit from the above tips? Not only can you apply the advice for your new year’s resolutions but with any resolution or goal you have in life. When you start your year on a positive note, it sets a trend for the remainder of the year. When you learn how to overcome setbacks now, you can conquer other obstacles that may come your way. When you implement these life patterns, you can change your behavior and performance for the better. Your confidence will increase as it gets easier to handle hardships. I wasn’t able to succeed right away with my resolve but don’t think I haven’t already come up with a plan to try again. My New New Year is about to begin! What are your goals for this new year? How do you plan to accomplish them? Any obstacles yet? Let me know. My concluding tip, don’t let any relapses slow you down or stop you. Remember, your resolutions are to improve yourself. There is no time limit on advancing your life. Are you ready to start? What are you resolved to successfully accomplish? Let me know in the comments below! Breaking bad habits is very hard to have this done. Old habits ever enrooted create difficulties for involved people and their families. Usually, whatever help has been welcome to hold the effects caused by bad habits on the most occasions. New Year’s resolutions are special for people who promise themselves to get rid of addictions and trends. This website content presents a magnificent work developed to help people to be aware of their liability to themselves. I congratulate you for what you are doing through this website, becoming people’s lives for the better. Keep up with this beautiful and helpful work. It’s very well done! Hi Karl, thank you for your observations. The New Year is an excellent time for us to promise ourselves to break unhealthy habits as it feels as if we have a fresh start to make our lives better. I really appreciate your encouragement and hope that people are benefitting from the tips I am providing along with my own firsthand experiences. I hope you enjoy the next post on How to Quit Breaking Promises as well! You made a very good guideline on how to maintain your New Year’s Resolution or ANY resolution for that matter 🙂 Good job and I wish you the best 🙂 Thank you for this! Thank you Paige! I am happy to see that you enjoyed and could relate to my latest post. I think that we all fall into the trap of thinking once we mess up we cannot try again. It is so much easier to pick ourselves up after a fall if we aren’t so hard on ourselves. I certainly wasn’t thinking of my weight loss goal as I ate dinner that night, but I felt guilty the next day. Instead of taking up a plate of the same food to eat as leftovers that following day, I filled up with fruits for breakfast, had a salad for lunch and pretended my slip up did not take place. It worked for me! I hope that these guidelines can help others as well. I wish you the best and hope you also enjoy the next post! Hahaha…loved your post! So many things you mentioned happened to me too and that quote you had pretty much summed up many of my new year’s resolutions. I agree with your suggestion to take the time to write down and plan your resolution. If you skip or miss some parts doesn’t mean it is over or failed. I know that many of my failed plans were due to not writing them down, it was more of an afterthought in hopes that I would persuade myself to go through with it. My resolution is a popular “Get in Shape” resolution. This year I have my wife in on it too. We are eating healthier and started to do yoga together before work. Thank you for the good laugh and wonderful ideas. Hi Paul, I am glad you enjoyed reading my post! Hopefully my temporary failure will motivate someone else to keep the resolutions they made for themselves or others this year. In my experience, it is much easier to accomplish a goal such as getting in shape when you have your family and friends to motivate you. If you are trying to eat healthy and your household is eating pizza and dessert in front of you, it weakens your resolve. Now you both can eat kale together! The yoga is an excellent step as it strengthens your body and clears your mind of distractions, making it easier to stay calm and focused. Wishing you and your wife all the best for your health resolution this year!